1971. A cocoa buyer and his wife. A vegetable farmer and firebrand mother of seven (bearer of twelve) and her husband. 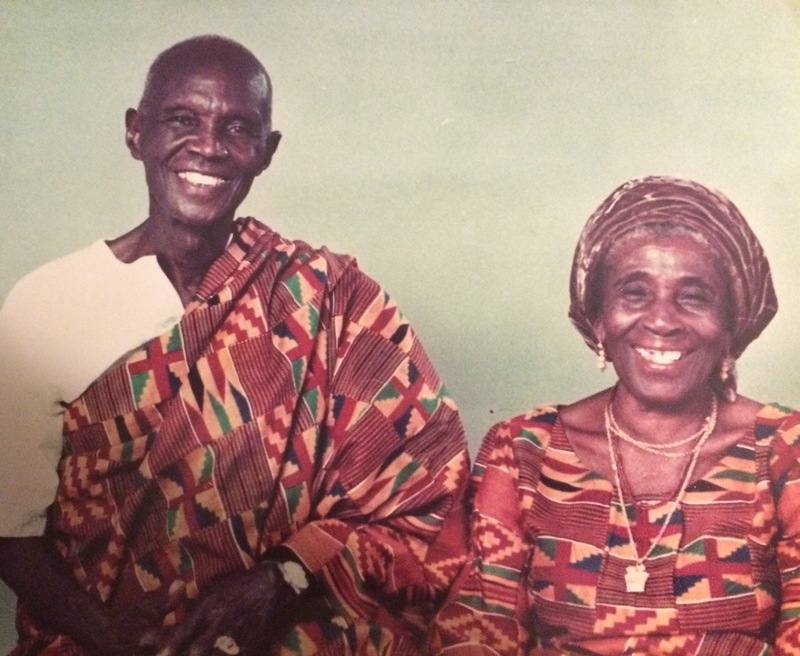 These are my grandparents, Togbe and Mama. Togbe was born in 1896. Ten years later, his future wife was born. According to my mother, Togbe taught himself to read in the 1920s, having been denied an education as a child. “The philosopher,” his children called him. Mama never learnt how to read but this never curtailed her caustic wit. Though I was but eleven when Togbe passed away, I still remember that they were each other’s raison d’etre and that they loved each other fiercely. After his death, Mama would croon the must heart-rending songs of woe on the front porch, bitterly weeping through the melody. She died two years later. 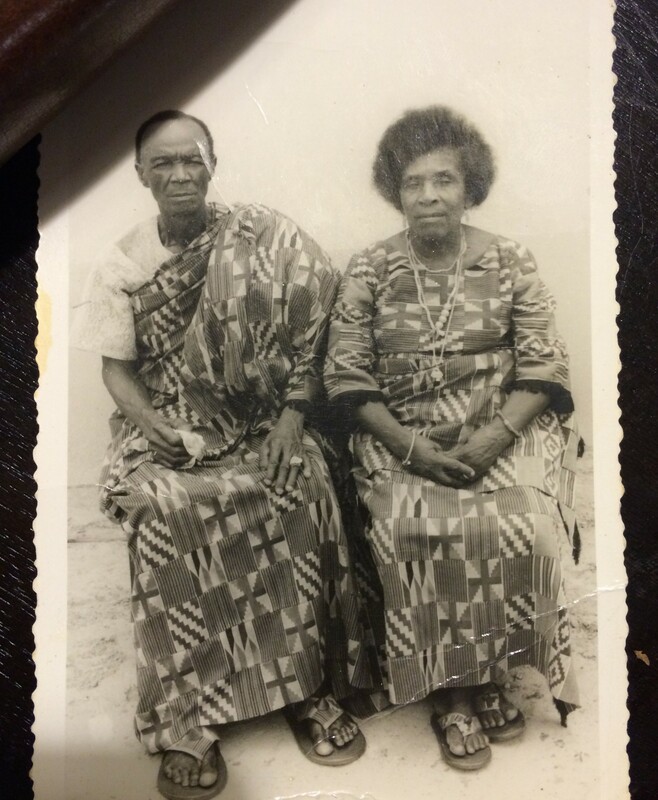 On the occasion of their 50th wedding anniversary, Mama and Togbe commissioned the weaving of matching Kente cloth and clad in all of its glory, they had this photograph “made”, as was the parlance of day. 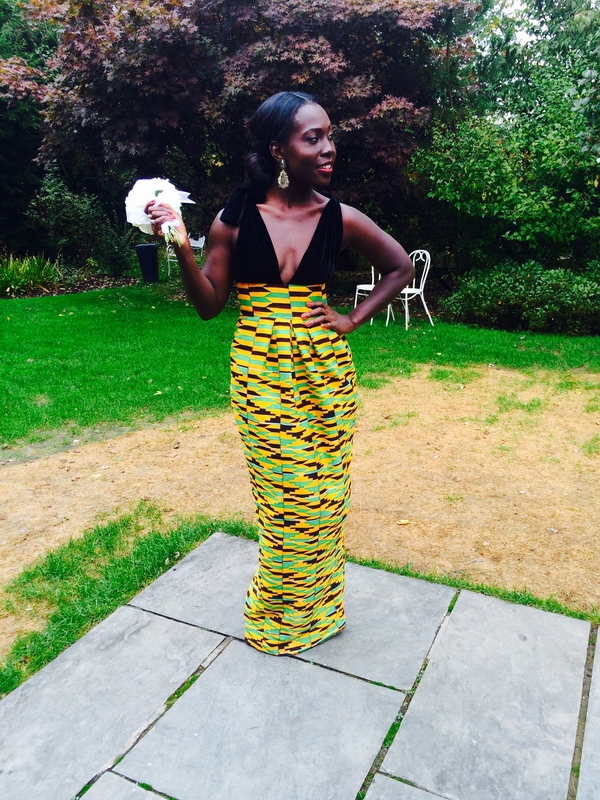 Kente: the fabric that has come to be synonymous with “Africanity”, garish only if you do not understand its origins. The legend is that some 300 years ago in the village of Bonwire, two brothers returning from the hunt, upon their imagination being ensnared by a spider spinning an web, watched the ordeal for two days and embarked on a journey to translate into a tapestry the silken intricacy they had seen crafted. They wove the first kente cloth out of the black and white fibres of the rafia tree and proffered their creation to the Asantehene— the king of the Ashanti people of modern day Ghana. The Asantehene, lest he appear to be too easily impressed, ventured that the cloth might be vivified if it were variegated and so was borne the bright idea to die the fibres red, yellow and green. Voila! An injection of colour into the culture. Soon, rafia was eschewed and the fabric was being woven of colourful silk threads to be worn solely by royalty. Ah! The cloth of kings! To this day, Kente is hand-woven on a loom by skilled “master” weavers, using a technique that interlaces vertical and horizontal fibres to yield patterns and colour combinations that each have historic and proverbial meaning, and the cloth is revered and reserved for the most auspicious of occasions. 1974. 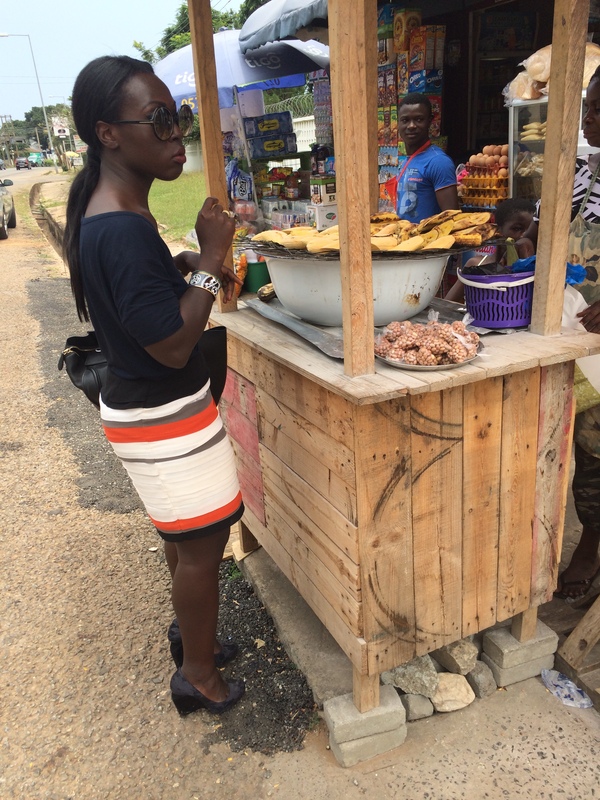 The last born child, 25, of the farmer and her mild-mannered husband poses for a photograph after church, in full Kente regalia. This is my mother: my not always agreeable mother; my not always tactful mother; my – though she may find it unfathomable – not always right mother. She also happens to be love incarnated—love and unflinching faith and every bit the layered tapestry that her parents wove: fierce, complex, humble in her beginnings, audacious in her aspirations. The cool green threads of her father in her, vulnerable yet sang-froid, are cross-hatched with her mother’s fiery red temperament. She is certainly as colourful as she is imperturbable. Sometime in the forgotten frenzy of my high school days, after her parents had departed this earth, this mother of mine let me borrow my grandmother’s 30 year old anniversary Kente cloth for a talent show or some such triviality. Given my feeble understanding, at the time, of the familial value of the piece, the cloth got left backstage and, like Lupita’s Oscars dress of pearls, was pilfered, never to be seen again. I, in turn, was meted out the silent treatment for a month or more, as though the flagellation by the knowledge that I had lost the Kente my late grandmother last wore the year I was born was not agonizing enough. I had lost probably the most expensive thing my grandmother owned, and a legacy of hers that my mother had been holding onto for dear love. I am happy to report that we survived the rift and that my mother let me live long enough to see this day, and to buy my first ever piece of Kente. Last year, a friend requested that her bridesmaids be dressed in their traditional garb for her wedding. Naturally, for me, with mixed Ashanti and Ewe lineage, this meant Kente. 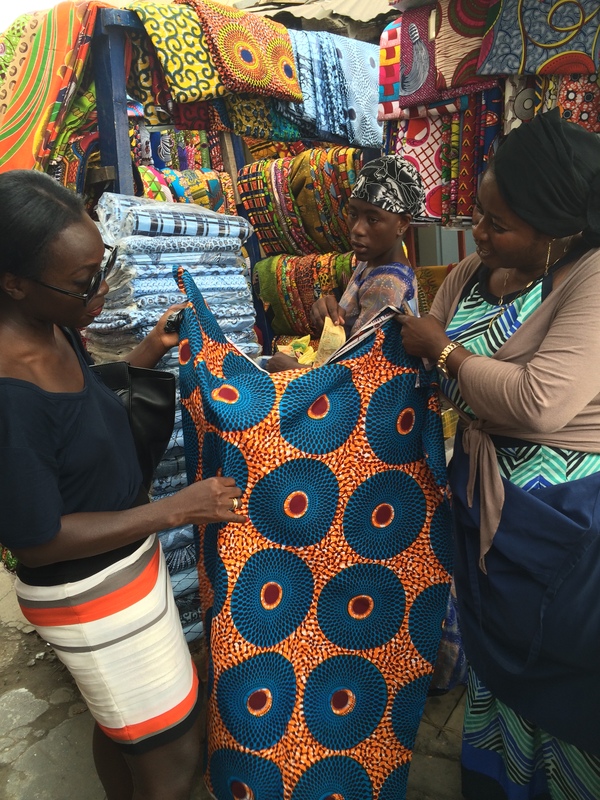 So, on a whirlwind trip to Ghana, I enlisted an intrepid friend to shepherd me through Accra’s bustling Makola market in search of the perfect Kente cloth for my tastes: one limited to no more than three hues of thread is the only way I can embrace this tradition on myself, given my deep-seated fear of sartorial profligacy with colour. I hadn’t enough time to custom order the cloth in tones of pastel, the “untraditional” colour scheme that seems to be de rigeur with my generation, so to the market we went. : Alexander Wang T-shirt, Club Monaco skirt, Nicholas Kirkwood shoe, Tom Ford “Carrie” sunglasses. 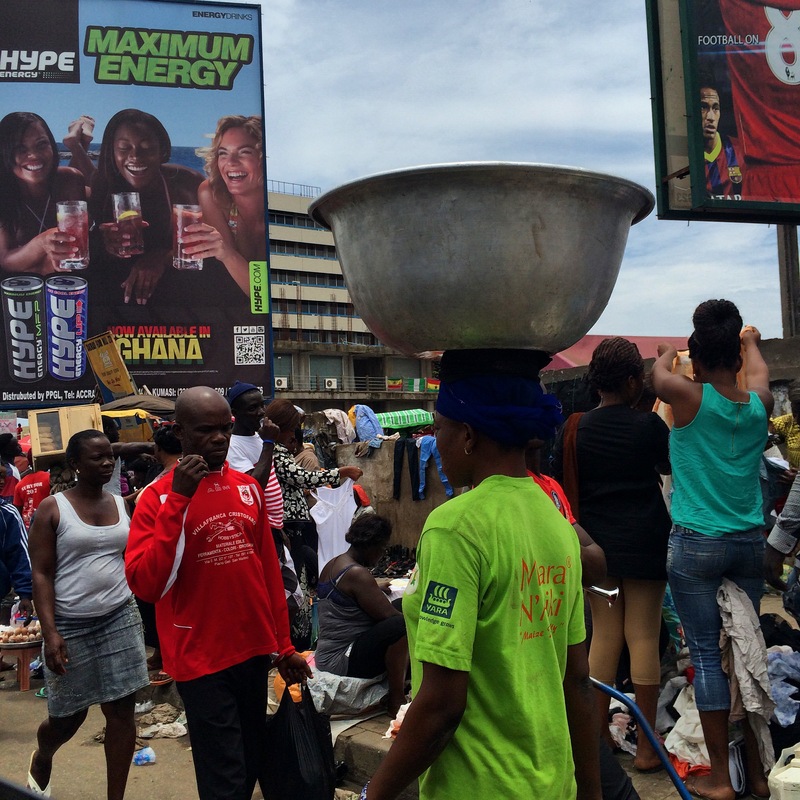 Makola is not for the faint of heart. Thanks to our no-nonsense driver, Ali, we meandered through the unruly traffic. 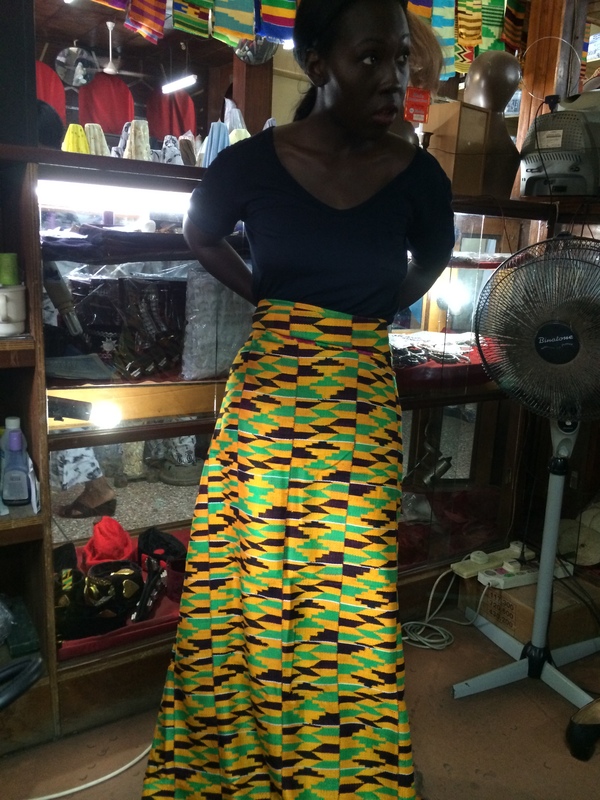 Swapping out my suede Kirkwoods for chalewote (rubber thong sandals), we threaded on foot through the thick crowd and finally found, after much chaos, the shop to which I had been directed by a dressmaker friend. If I thought the smells and sounds of the market had been an assault, I was not prepared for the blow that was about to be dealt my wallet when I zeroed in on the cloth I wanted. 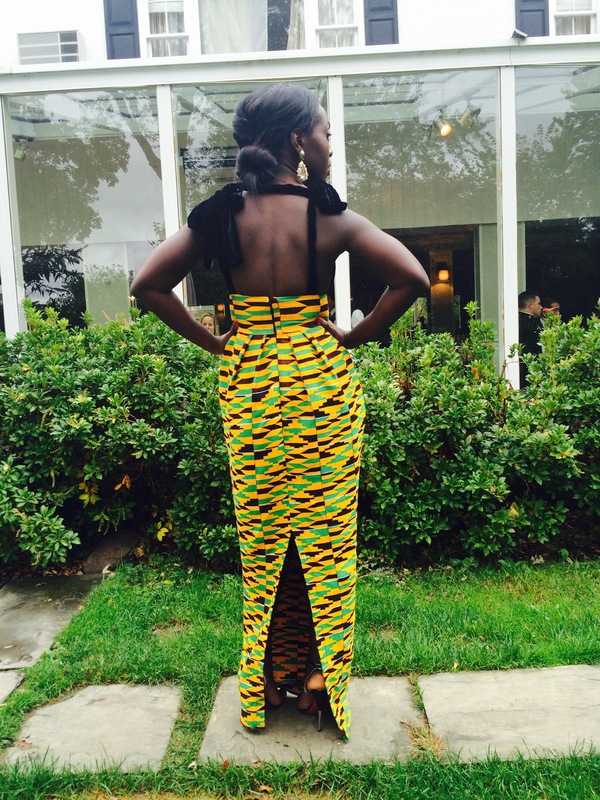 Nobody, but nobody, told me how expensive Kente is! But, I was sold. I was in love with how classic the version of the cloth was colourwise and how clean the pattern. I held it up against my skin. “What do you think, Marmette?” I asked, under the guise that her approval mattered. Frankly, it was too swelteringly hot for either of us to pretend we had the energy to continue the search anyway. The deed was done. Once I had exchanged the blaring of car horns and cajoling calls of merchants for the calming whirr of air conditioning, I was able to think of how now to render the cloth as a dress. Given the rich, thick texture of true Kente (not be confused with less-esteemed Kente print, you know, the stuff of Jeremy Scott’s Adidas sneakers and Kwanzaa tablecloths), I was tempted by the idea of mixing in another textural fabric. I had recently seen an editorial in W magazine that featured the most enchanting back of a dress ever. Plain stealing that concept from Valentino, I translated that back to my design which I sat sketching in the cool coffee shop. Given the assortment of colours and lines present in Kente, simplicity of silhouette is paramount; tempering its patterns with a solid colour is advisable. 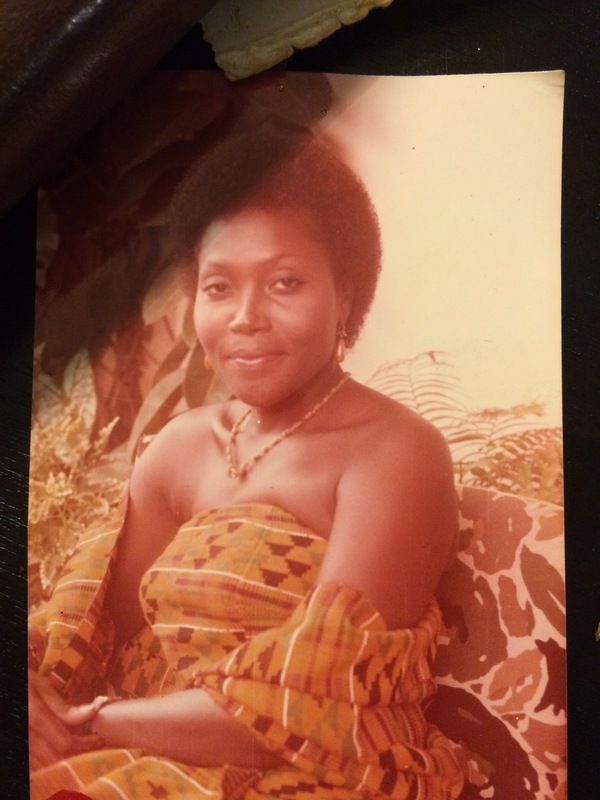 So, for my friend’s wedding in Westchester County, New York, I decided on a dress with a tulip-shaped skirt, wide waistband and deep-V bodice in jet-black velvet to show of the body part after which I most lust when looking at old photos of my mother: the clavicle. I contacted my designer friend Mina Evans, and she interpreted my dream of many colours into a dress I hope have the chance to wear again and again and again. 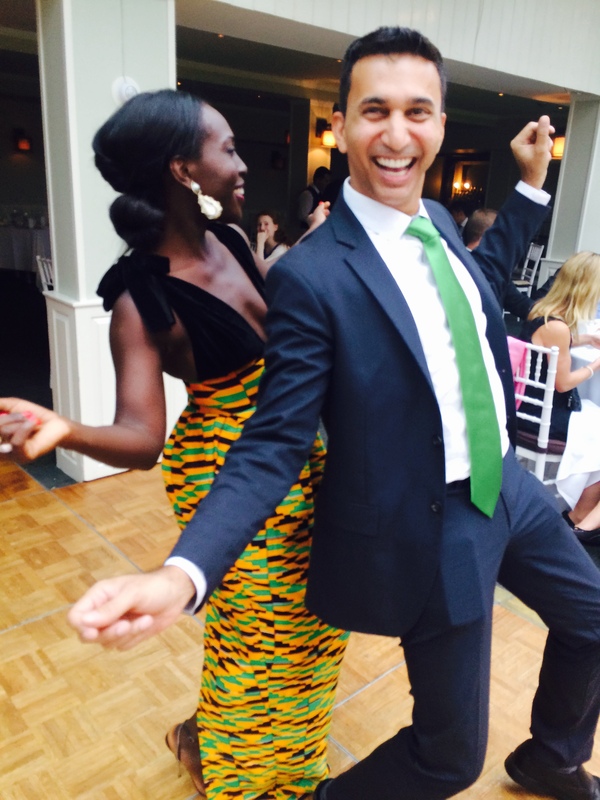 I wove some good memories in this dress, dancing the afternoon away with the newlyweds. I like to think that I will make many more in this dress, and that should I have a daughter (or son) she (or he) will look at these photos with the same awe for tradition and wonderment at the things in a culture and a family that persist that I do when I study the photographs of my mother and my grandparents. The love that my grandparents had for each other, the love that my mother is to her children (even after they carelessly mislay her dead mother’s most prized possession), that is the concinnous through thread here. 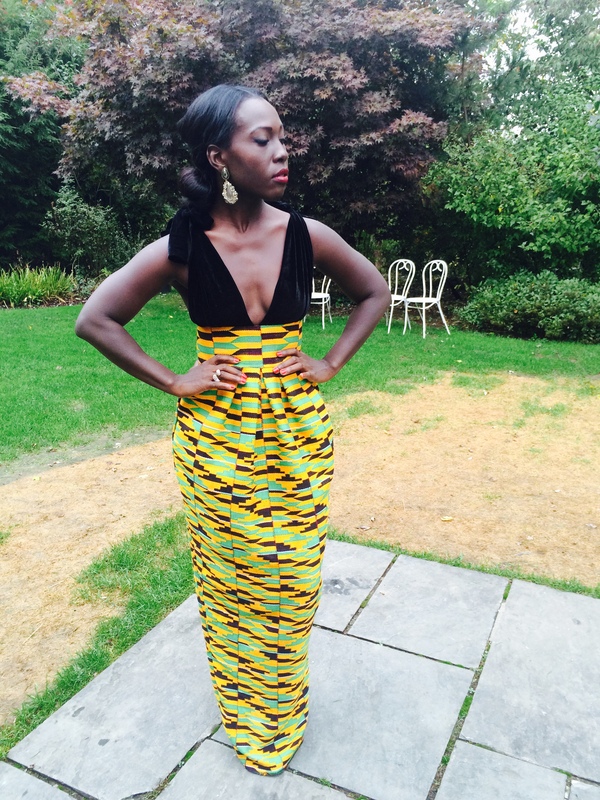 Like Kente, like tradition, what is durable is beautiful. What is durable, is love. Beautiful pictures of your parents and I’m coveting that dress! Lovely essay! I, too, just got my first Kente and its something that I will treasure and hand down from generation to generation. What a fitting portrait of tradition, family, love and Mummy Esther’s capacity for forgiveness! And clavicle-y speaking, you are definitely your mother’s child. #ouidieux serving for the gods and his creations.